One of the benefits of a section break is that it lets you set certain areas of a Word 2013 document in different columns than the rest. You can create the section break first and then change the number of columns in that section; or you can select the text that should be differently columned and then change the column setting, and Word will create the section breaks as needed. In a Word 2013 document, choose View→Draft to switch to Draft view, if you’re not already in Draft view. Scroll to the top of the first page and place the insertion point at the beginning of the heading line. A continuous section break is inserted. Because you’re in Draft view, you can see it; you couldn’t see it in Print Layout view. To check, switch to Print Layout view and then switch back to Draft view. The text in the section that follows the section break changes to a two-column layout, and the view switches automatically to Print Layout. For more practice, try each of the other settings on the Columns menu. Return to the Two setting when finished experimenting. 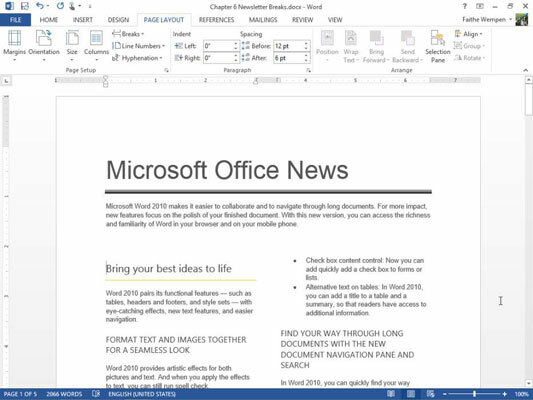 Select a heading, THE MICROSOFT OFFICE BACKSTAGE VIEW in this example, and everything below it to the next heading. Select up to, but not including, the Recover unsaved work heading. The selected text changes to a single-column layout; the rest of the document stays the same. Choose View→Draft and notice the section breaks that Word automatically inserted. Continuous section breaks appear at the beginning and end of the selected text. Choose View→Print Layout to return to Print Layout view.